last 12 months, Clean Ride can provide the ultimate protection without modifying your paint system using the world famous Motorcycle & Car care products from Swissvax. We will lovingly and passionately protect your investment, covering every part of your Motorcycle using the complete range of Swissvax products, from body work and plastics right down to your wheels. We understand Motorcycle care like no other, come and experience our first class professional service and treat your Motorcycle to the best protection money can buy, at a price that represents true value for money. 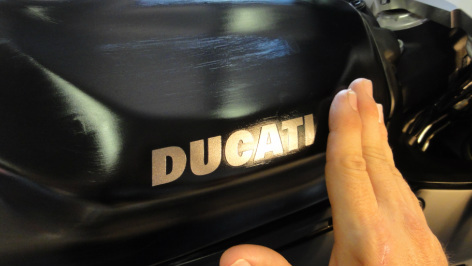 Each Motorcycle will be fully detailed with all exterior surfaces treated with the Swissvax Paint Protection system - A truly extraordinary coating meticulously handcrafted in Switzerland and applied only by detailing professionals for a long lasting protection and a beautiful finish. The Swissvax Paint Protection is a modern and innovative system for the ultimate protection under the harshest conditions, and is a special Carnauba wax, which was enriched with non-stick PTFE (Teflon) in order to create an ingenious protective shield for your paintwork ensuring a long lasting smooth as glass paintwork surface. A Run down on how to use your new kit is also included so you can maintain the shine for years to come. Should you have any questions relating to our services please do not hesitate to contact us to confirm availability when booking - however we will work to meet your needs. We're here to protect your Investment.